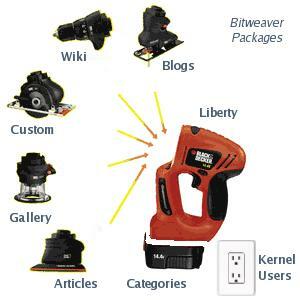 bitweaver is a web application that offers a complete suite of powerful feature sets in a higher modular design. To understand how bitweaver is designed, you must understand that it is completely modular, on multiple levels. Package - the largest grain of our modular architecture, it is a intended to be a large feature scope - such as the WikiPackage or BlogsPackage. The term Package was introduced as a concept in bitweaver and TikiWiki by Dennis Hetzel. Modules - we have maintained the "Modules" term to be identical to the TikiWiki usage. Modules are the "blocks" (in *nuke terms) of data that appear on the sides of the page - such as "Last changes" or "Last blog posts"
Plugins - Packages can contain plugins inside them to enable modular functionality. The LibertyPackage and WikiPackage both have their own plugin architecture to handle different data. These feature sets are known as a bitweaverPackage. The primary goal for bitweaver was to place the fewest possible requirements possible on a bitweaverPackage and provide the most flexible environment possible. There is a KernelPackage that provides a core set of functionality that provide global services (such as preferences, user authentication, themes, permission and such).